What: This biennial meeting brings together commissioners and advisory delegates from 172 presbyteries in the United States, as well as other delegates and observers from around the world. The Fossil Fuel Divestment Overture was one of the most talked about items up for discussion and debate. Why: The Fossil Free PCUSA group, and other supporters of the PCUSA divestment overture are deeply concerned about current and future effects of climate change. We look forward to working with MRTI on this critically urgent issue. Scientific research confirms that carbon dioxide emissions from burning fossil fuels are the main cause of climate change. The impacts on agriculture, water, public health, and vulnerability to disasters are severe and will worsen as global temperature rises. In order to limit climate change to less than 2 degrees Celsius, we must transition rapidly to renewable energy. This evidence is motivating people of faith in various communities, as well as students at multiple academic institutions, to embark on divestment campaigns. This reality is motivating people of faith in various communities, as well as students at multiple academic institutions, to embark on divestment campaigns. The campaigns urge the financial agents of their respective organizations to withdraw stock and bond funds from investment accounts which contain fossil fuel company shareholdings. This action would align our investments with our values of Earth stewardship and social justice, and free resources to invest in energy efficiency and renewable energy solutions. We also hope that as part of a global movement, divestment by the PC(USA) can help build public awareness and political will to regulate the greenhouse gas emissions causing climate change. This General Assembly is clear that discernment about the crisis of Climate Change must and will be accompanied by action to assure that our investments are fossil fuel free. Our first intention was to affirm and appreciate the work done by 12 Presbyteries, not just 1 or 2, but 12 Presbyteries, to bring this critical issue of climate change before the assembly and encourage us to take action now! - Gina Struensee, Ruling Elder Commissioner, Winnebago Presbytery, DCE First Presbyterian Church, Neenah, WI; author of minority report. The Young Adult Advisory Delegates, of which I was one, voted for a stronger action in a minority report. Clearly, when our church decides to take action, it is powerful and transforming. We are not always quick to act. We don’t have much time for engaging in shareholder actions or activism. It’s time for PCUSA to speak with a strong, prophetic voice to break the gridlock on this issue so that we might finally be able to create positive change. Now is the time for bold, transforming action. Just think where we might be in a decade. The Arkansas Presbytery voted for full discussion of this overture and is fully behind this grassroots movement. At Ferncliff Camp and Conference Center, we have the world’s first LEED Platinum certified building, and participants at the camp and conference center are taught about renewable energy sources and energy efficiency; we also have “Solar under the Sun” learning opportunities. We, in Arkansas, also have extreme fluctuations in weather over the past two years which concern us a great deal, and we have environmental problems related to fossil fuel extraction and shipping. As a young person seeking to be faithful to God’s call to care for the Earth and love my neighbors, I want to give my tithes to a church that will use them to “serve and keep” the Creation (Genesis 2:15). By divesting from fossil fuels, and RE-investing in renewable energy, the PC(USA) can strengthen the global movement to mitigate climate change and protect the lives and livelihoods of vulnerable sisters and brothers. My spouse and I just had our first child. We named him Rowen after the Scottish Mountain Ash tree which is now threatened by a changing climate. Climate change is frightening. And as a new parent, I want to do all I can to help make the future a less scary for all who come after us. Our son just recently discovered he has hands, and that they are connected to his body, and that he has some agency over them. Our Reformed faith reminds us of the same truth that, like our son, we sometimes don't realize that in God's grace, we have some agency to make real changes to the ways we have always done things in order to make our world less scary for future generations. It is my deepest hope and prayer that we as a denomination will "remember our hands" and make a clear commitment to divest over the next 5 years from fossil fuels. In so doing we do not lose our voice at all, but in fact make a powerful moral statement to our world that we as a church refuse to profit from that which threatens the very future of our planet. We have a wonderful way to shepherd this commitment through our MRTI and I am excited about how we can honor their incredible legacy of prophetic stewardship while making a clear commitment to divest. As the church we serve as the moral conscience of the nation. To divest means we are making a prophetic statement our country needs to hear. Rev. Paul Henschen, Ellendale, N.D., Overture 15-01 Advocate. Presbyterians agreed to take on the issue of fossil fuel divestment today. Although no dead line for complete divestment was established most believe that the church will honor the world wide goal of five years for complete divestment of its over $200 million dollars, which may be the largest fossil fuel divestment to date by any entity. The IPCC reports are increasingly urgent: humanity must disentangle ourselves from fossil fuels and invest in renewable energy. Ethically, we cannot profit from earth’s destruction. It is important that the church pay attention to the excesses of our society and the ways in which we do damage to creation and to our own future. The crisis we face calls for prompt action, and this divestment is a gesture in the right direction. Pray for PEC as GA Approaches! It's GA super countdown time! If you are coming, PLEASE stop by the Exhibit Hall Booth 502 and check in with us! If you are unable to come, we ask that you hold the overture advocates and commissioners in prayer as we seek to further social and environmental justice at the 221st GA. Follow PC-Biz on the web including the Immigration and Environment and the Social Justice Committees as they discuss our overtures. Please keep us in your prayers beginning on Monday and Tuesday, when overtures are presented, including those on Divestment from Fossil Fuels, Sustainable Development/Precautionary Principle, Coal Export and Food Sovereignty. 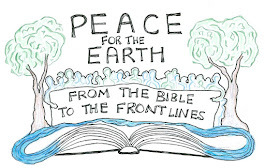 Our PEC Luncheon will be held at Fort Street Presbyterian Church, where we will hear a brief video prepared for us by Bill McKibben of 350.org. Our keynote speaker will be Fletcher Harper of GreenFaith who will speak on divestment from fossil fuels. We will also be wishing a happy fifth birthday to Earth Care Congregations and hearing about our annual award winners. We welcome Fossil Free PCUSA to our booth and hope you will ask your commissioners to visit one of their representatives including Dan Terpstra and Wil Howie, who organized the movement. Abby Mohaupt and Susan Chamberlain from First Presbyterian Church of Palo Alto (among 5 others) represent the church who initiated the overture. Strength and wisdom to all of us in this amazing journey! Grant us courage, grace, wisdom, and strength during this General Assembly and in the days ahead. Give us discernment as a body of Christ in seeking social and environmental justice now and through the years to come. In deep gratitude we pray. For years I have been using the phrase “things are heating up” when talking about family and business issues that need attention. The phrase takes on new meaning when applied to the constellation of issues that involve God’s good earth. Things ARE heating up! Literally and metaphorically. Naming some of them could fill the page. But, I’d like to talk about solutions instead. How do we, Presbyterians for Creation, gather the issues together to be held up to the next assembly? In looking at different models, we have found, already in our care, a local group doing just what feels like the-very-thing! Yukon Presbyterians for Earth Care meets by phone with a computer file of photos (so everyone can put a face together with a name). People with concerns talk about their communities and problems. It has worked well enough for them to birth a Regional Conference this September—and we are all invited! This conference is focused on climate change and is still looking for participants! The Steering Committee has endorsed the model and is giving it a field test in the Northwest Region. Meetings will be every other month, for an hour. A call-in number is used and anyone who wants to join in can. Meeting minutes are sent to all who have an interest. Like our national Advocacy meeting, we open and close with prayer, invite someone to address an issue that needs our hearing, and follow with a discussion. We end with ideas for further reflection and/or action. If we start now how many of our hearts concerns can we lay before the next General Assembly? When the Coal Export Overture came before Seattle Presbytery a young woman stood before the gathered meeting. She spoke of attending hours and hours of meetings on environmental assessment. She often testifies and when she does she wants to be standing up knowing that the whole PC (USA) is standing behind her. YES! When you raise your voice wouldn't you like to know that you have that VOICE standing with you? That is the dream we hope to turn into reality for the general assemblies to come. The idea of regional advocacy is coming your way! The timeline for that will vary with each of my fellow regional reps. I’m hoping, when they contact you, that you will jump in with ears to hear and ideas to promote! Blessings to all who HOPE in a world where things are “heating up”. We pray for the new ventures of PEC. We pray for a voice that can be heard all over your globe. We pray that we can give voice for the creatures we live with that have no human sound. Bless our time in this General Assembly and in the ones to come. And, give us discernment on how to turn the heat down!